Use a big chalkboard to let guests know the party plan — a chili and beer tasting worthy of your foodie friends, complete with voting for favorite chili and prizes for lucky guests. Don't have a chalkboard? Use any big frame (ours is a flea market find), cut a piece of foam board to fit and paint with chalkboard paint. 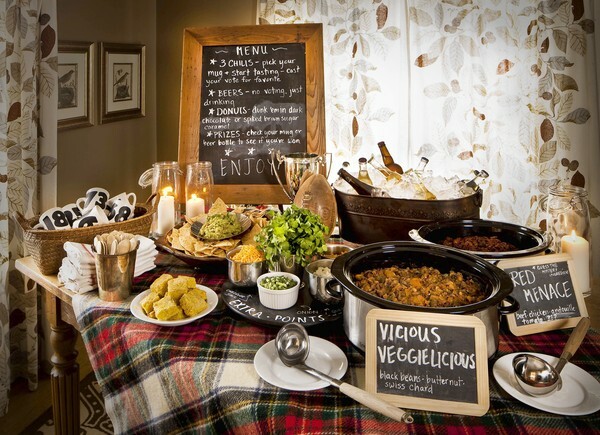 Jot your menu and the basic party details on the board. Chalk markers (available at craft stores) are an easy-to-use, non-smearing alternative to standard chalk. 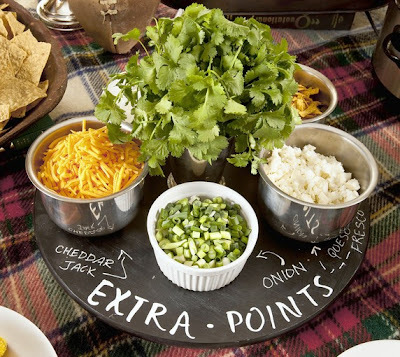 It's not so tricky to turn your extra points into something worth celebrating — a lazy Susan (also an Ikea find) painted with more chalkboard paint puts a spin on the toppings, and makes them easy to access. Offer plenty of goodies to complement the chili, then keep the rest of the food simple: chips and guacamole to munch and Southern-style cornbread on the side are all you need. Keeping one hand free (to hold a beer) is crucial. So serve your chili in mugs, which you can score by the dozen at thrift shops. (Ours cost just 49 cents each.) Customize mugs with stick-on numbers (intended for use on school projects, find them at craft or big box stores) to make it easy for tasters to keep track of their own mug. 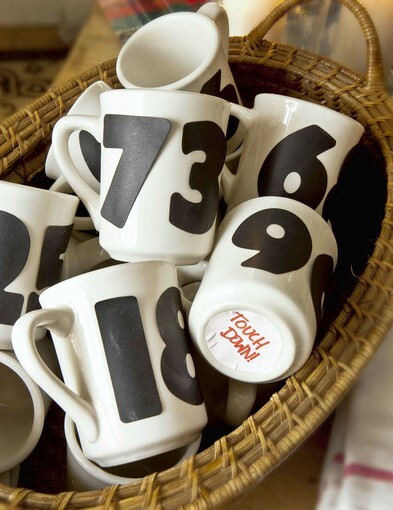 An alternate play: A mix of kitschy thrift store mugs touting everything from tropical destinations to local plumbing supply stores are another way to keep each mug original. Stickers on the bottoms of a few mugs award prizes to their owners, making it even more fun to grab a mug and get started tasting.